Several kinds of graphical feedback are used to provide different kinds of information when editing and analyzing a CP-net. A speech bubble is a yellow rectangle that provides context-sensitive information. Some speech bubbles appear automatically, while others appear after a slight delay after the cursor is moved over an appropriate object. For example, moving the cursor over a declaration with a syntax error will cause a speech bubble containing an error message to appear. Error messages during syntax checking. Tool tips for tools in palettes available. The result of applying the Evaluate ML tool. The full path to a saved net. To see the full path, move the cursor over the name of the net in the index. To make a speech bubble disappear either click on it, or move the cursor away from the object with which the speech bubble is associated. Status bubbles are color-coded bubbles that occasionally appear at the bottom of the index. Move the cursor over a status bubble to see the corresponding speech bubble. Green indicates that an operation was completed successfully. Red indicates that an error occurred when executing an operation. Light purple indicates that a time-consuming operation, such as a long simulation, is currently being executed. Color-coded auras are used to highlight objects with particular characteristics or to indicate different kinds of relationships between objects. Auras are associated with places, transitions, arcs, inscriptions, declarations, monitors, page tabs, and index entries, such as page names and net names. (Bright) Red indicates objects with errors during syntax checking and when simulating nets. Dark reddish auras indicate non-unique names of places and transitions when syntax checking. Green indicates enabled transitions when simulating nets. Dark blue indicates dependency between declarations and other elements, such as places, transitions, and pages; see syntax checking. Aqua indicates which object an inscription belongs to; see syntax checking. Orange indicates that syntax checking of an object has not yet begun. 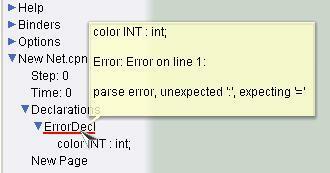 Yellow indicates that syntax checking of an object is currently being performed. Pink indicates which fusion places belong to a fusion set. Aqua indicates port/socket assignments and super-/subpage relationships when working with hierarchical nets. The standard cursor is an arrow or just an arrowhead, e.g. The hand cursor, i.e. , indicates that an item can be moved. The crossbar cursor indicates that it is possible to edit text. The double-headed arrow cursor indicates that an item can be resized. The directions of the arrow heads indicate which direction the item can be resized, e.g.. horizontally , vertically, or both simultaneously. The hourglass cursor indicates that a time-consuming operation, such as opening a net, is being performed. After picking up a tool from one of the palettes, the cursor will change to indicate which tool has been picked up. For multi-phase tools, i.e. tools that are applied by clicking on more than one object, the cursor will indicate which phase of the tool will be applied next. Examples of multi-phase tools are the assign port-socket tool and the set subpage tool.